Sylvia A. 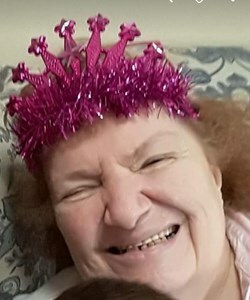 (Lardeo) Smith, 70, of Syracuse, passed away November 20, 2018. Sylvia was born in Syracuse, NY on September 24, 1948 to the late Alfred and Mary Gray. In her free time she enjoyed writing and publishing her poetry. She was also an avid cat lover and adored spending time with her grandchildren. She is survived by her Sons, James (Jessica) Lardeo, Raymond (Jennifer) Lardeo and Michael (Patricia) Wood; Several Brothers and Sisters and multiple Grandchildren. Visitation will take place on Thursday, 4-7 PM at New Comer Cremations & Funerals, N. Syracuse. A funeral service will be held on Friday at 10 AM at the funeral home with burial to follow in Valley Cemetery. To share a memory of Sylvia or leave a special message for the family, please click the Share Memories button above. Add your memories to the guest book of Sylvia Smith. Sylvia, (Mom) I miss you so very much. You were such a kind, compassionate person. So easy to get along with. I could not have asked for a better Mother in law. I really believe that one of her purposes here on Earth was to bring joy to little children. She LOVED kids. Any, and all kids. But, without a doubt, her grandkids were her everything. She was also a fantastic Mother to three great men. For the past three years, Sylvia allowed me to help take care of her. We have always been close, but taking on that role in her life, made us even closer. I feel like there is going to be a big void now that she is gone. But, I will continue to ask God to pass on my thoughts of her while I pray to him everyday. I know she is smiling down on us now. Until we meet again Mom. May you now and forevermore rest in peace. I love you. I was so sorry to learn of Sylvia passing and was unable to make it for the calling hours.Deepest sympathy to you all. We had some good times together. We are so sorry and our hearts go out to you for your loss. My father and all of us will remember her for her smile,laughter and most of all her love. She was a beautiful soul that left beautiful memories for all of you. She will live forever in her loved ones hearts. Oh, Aunt Sylvia. There are so many memories that we share. If I were to name them all, it would take a lifetime. All of the memories have laughter and fun in them. I will miss you and talking to you about all the fun we had. Mom is missing you like crazy already. She misses her daily calls to catch up. Rest in peace, Aunt Sylvia. Jimmy, Ray and Mikey, daughters-in-law and the grandchildren, hold onto the good memories. She was one of a kind. Our hearts are broken for all of you. You had a beautiful thought full mother sweetheart she was a dear friend lovely lady and wonderful grandma,these children love her so much. I'm going to miss her so very much as well as everyone will. She is always going to be remembered for all the love and kindness she gave so freely.Godbless you all I'm thinking of you and praying for you. Jimmy Ray and Mike lean on each other now hold each other up and remember all the wonderful time you had with your beautiful mother she would want this. Sylvia was an amazing woman. She loved everyone she met no matter what they did or who they were. I remember when she was so excited to she Leia her granddaughter and need a few groceries. She asked that we leave Leia with her and she pushed her around on her walker. It was a great day. Loved and never forgotten always. Fly high mom until we see each other again.